Basics is appropriate for everyone. 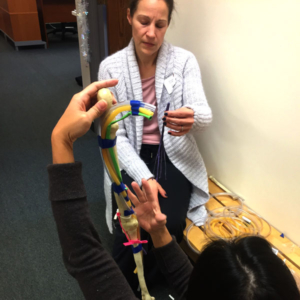 Continue to build your skills with Bridging® Applications, a much more specialized course for therapeutic and movement professionals. Looking for quick insights to make fast and meaningful changes? This is the workshop for you! Building on the introductory workshop, we take students deeper into the Bridging technique with some introductory movements. This six-hour workshop is both experiential and theoretical. The neurological basis for the movement reactions is discussed as are the most fundamental organizing movements from early development. 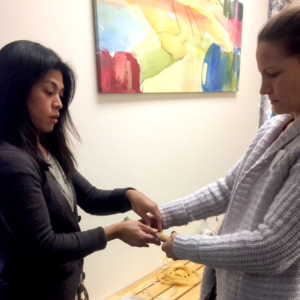 The Bridging Basics workshop is open to parents, family members, and professionals, both in the movement and mental health arenas. The movements learned are generally good to calm active, growing children, as well as adults with recurrent movement or pain challenges. 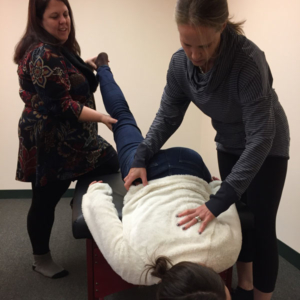 The movements we’ll share are particularly useful for therapeutic and movement professionals wanting to make sure their own interventions leave a person in physical balance at the end of a treatment/session (acupuncture, massage, Pilates, yoga, EMDR, etc.). The three most fundamental organizing movements of the body are explored and practiced. You will be able to assess and center a person by the end of the day. The neurobiology and physiology related to the muscle and nervous system reactions will also be explored. Finally, we will also cover precautions and how to identify patients where the Bridging Technique may not be the best option. Still searching for new ways to make amazing differences in your clients/patients? This workshop is for you! This series of four ten-hour workshops is designed to add depth and skill to professionals who want to add Bridging to their skill sets. The concepts progressively add detail related to the multiple systems co-regulating within our bodies. The additional Bridging movements and regulation principles explored will integrate more specific principles of physics. The schedule-at-a-glance o fall Bridging courses is here. The full schedule and description of all Bridging courses is here. Questions? Here are some FAQs.